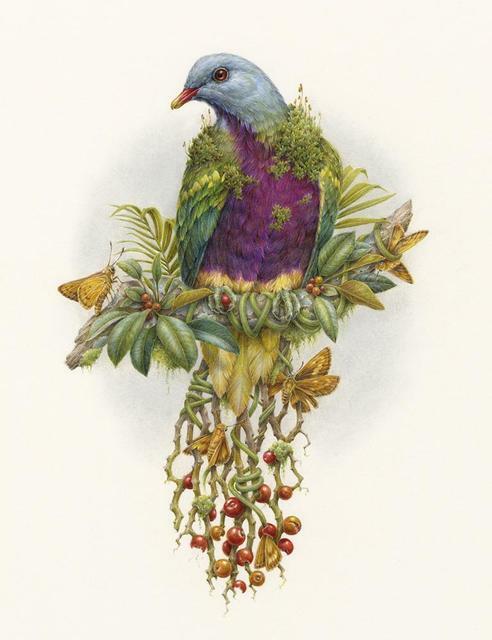 Botanical Bestiary is an exhibition of new works by Courtney Brims, Lauren Marx, Crystal Morey and Thomas Jackson. 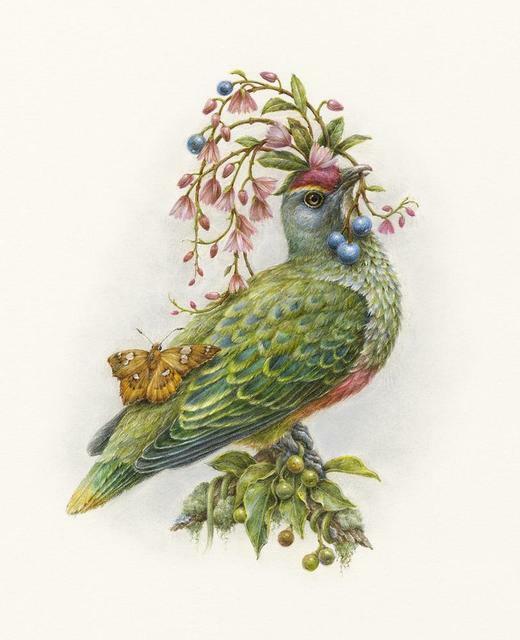 Brims’ drawings are inspired by the Australian rainforest and natural processes, such as pollination, propagation and dispersal. Marx’s pieces address her obsession with iconography while also exploring spirituality and healing. Morey’s hybrid porcelain figures, including human, animal and botanical elements, show that we are dependent on each other’s well-being. 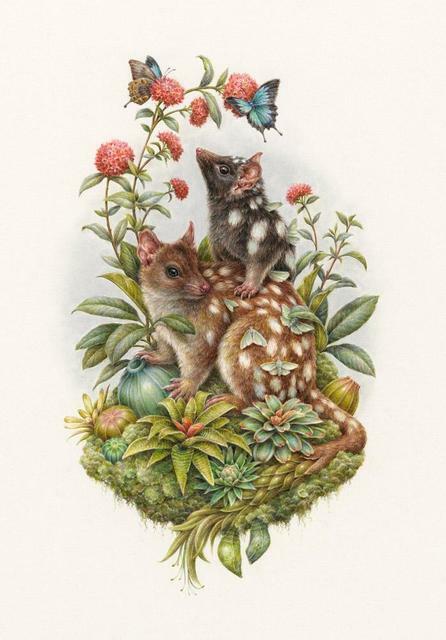 Jackson’s paintings reference native Australian plants that utilise fire for germination and fire’s effect on the animals that use such plants for food or habitation. OPENING NIGHT: Saturday, August 11, from 6pm – 9pm. Free entry. This exhibition runs from August 11 to September 2. For Lauren Marx, animals always have been a passion. They have been the subjects of her drawings ever since she was a child, which she attributes to weekends spent at the St. Louis Zoo and endless hours watching the American TV show Mutual of Omaha’s Wild Kingdom. These pastimes influenced her desire to learn about biology while attending high school, during which time she began collecting bones, feathers and books. Marx’s interests grew to include zoology, cosmology, and mythology. In the spring of 2012, she combined her obsessions into one drawing, Galactic Collision, the theme of which has been the focus of her work ever since. She graduated from Webster University with a bachelor of fine arts degree with an emphasis on drawing. She currently resides in St. Louis, Missouri. Courtney Brims is a Brisbane-based artist and illustrator. She creates intricate pencil drawings that seem to stem from a world that hovers between a daydream and a nightmare. She graduated with a degree in interior design from Queensland University of Technology before becoming a full-time artist in 2008. Since then she has had numerous solo shows across Australia and the United States and collaborated with national and international brands. Brims’s work explores her curiosity about the natural world, specifically the interplay between prey and predator through adaptation and metamorphosis. She depicts scenes where animals become entangled within weaving hair and vines and nest in skeletal remnants, hinting at humanity’s impermanence. Crystal Morey uses porcelain to communicate the interconnectedness and balance between humans and the natural world. Her work explores stressed ecosystems, including the endangerment of species, using traditions of realism, craftsmanship and art historical porcelain. Her goal is to create a contemporary, science-based narrative that reminds us of the natural world and our relationship with it. Morey has a bachelor of fine arts degree in ceramic sculpture from the California College of the Arts as well as a master of fine arts degree from San Jose State University. She currently lives in Oakland, California, and exhibits her work regionally, nationally and internationally. Thomas Jackson is an Australian artist and illustrator who was born in Bolton, United Kingdom. He moved Sydney as a child and was instantly drawn to the natural wildlife of Australia. 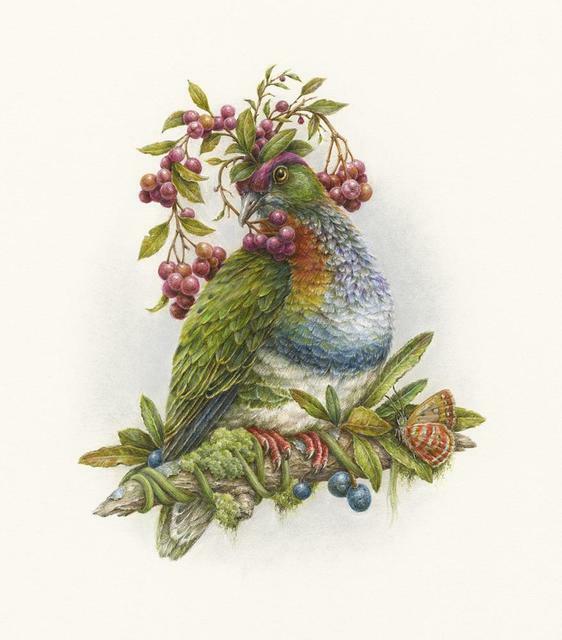 Fascinated by the local animals and landscapes, he drew inspiration from his new home, as well as scientific plant and animal specimens, entomology and taxidermy. Today, Thomas puts a modern take on natural history illustration, painstakingly creating small-scale works for galleries and translating these into large-scale public murals.